Beaver on Taylor Creek, finding something to eat in the middle of winter. The beaver is the largest rodent in North America. It is semi-aquatic with a large, flat, paddle-like tail and large, webbed feet. Its nostrils and ears seal shut when submerged. They are excellent swimmers and can remain submerged for up to 15 minutes. They do not hibernate; therefore the lodge is an important source of shelter, providing a safe haven from predators. The beaver eats the leaves, buds and inner bark of trees; also cattails, water lilies and other aquatic vegetation. They do not eat fish. Beavers mate for life and remain with their young for two years. 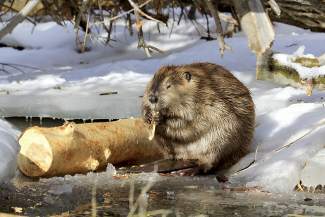 TAHOE-TRUCKEE, Calif. — Beavers at Lake Tahoe are faring better than they were just a few years ago, thanks to the efforts of Sherry Guzzi and her posse of volunteers, collectively known as the Sierra Wildlife Coalition. As is the case with many people who become passionate defenders of wildlife, Sherry’s involvement began with the death of a beaver family that had become dear to her and countless other residents and visitors to Kings Beach during the fall of 2010. This family of four beavers, two adults and two young, had built themselves a lodge in Griff Creek, which runs near Highway 267 in Kings Beach, before flowing beneath the road and into Lake Tahoe. When beavers build a lodge, they also build a dam, behind which water gathers, creating a pond. This pond enables the beavers to swim safely into their lodge and helps to keep the water around their lodge from freezing solid in the winter. As you can imagine, the very nature of the dam can create flooding in areas surrounding the lodge. Sometimes, these areas also happen to be areas where humans have created roads or buildings that are threatened by this flooding. Obviously, we can’t allow homes, roads or businesses to be flooded so what is to be done? Sadly, in this instance, authorities decided to remove the lodge and kill the beavers. Even more sadly, this particular dam did not threaten any structures, as the dam was only one foot high and any resulting overflow would have gone into the nearby culvert. The killing of the beavers did not sit well with the humans who had become enamored with the animals from watching their daily activities. Sherry, along with co-founder Mary Long, created the Sierra Wildlife Coalition with the purpose of serving as champions of wildlife, and particularly beavers. The SWC is active in South Lake Tahoe at Taylor Creek where a system of pipes has been installed — using the brains and brawn of Ted Guzzi, Sherry’s husband — which keeps the water at a steady level, without flooding. The pipes are placed in such a way as to allow enough water to remain behind the dam, protecting the beavers and the lodge, yet keeping the water flowing and maintaining the surrounding area. These Pond Levelers have been installed in several other areas, a win-win situation for beavers and agencies responsible for managing our waterways. An important function of the SWC is educating not only the public, but public officials as well. It has been believed in the past that the beaver is not native to the Sierra but au contraire! By the early 1900s, the native beaver had become virtually extinct, due to excessive trapping. Beavers were reintroduced to the Truckee River between 1934 and 1949 to prevent steam degradation and to promote wetland restoration because it was discovered that beavers actually benefit the streams and surrounding vegetation. Not only are they native, they are also a necessary part of the ecosystem surrounding Lake Tahoe, helping to keep the lake healthy and clear by creating natural filtering zones for water from streams about to enter the lake. They create ponds where fish can thrive, as well as the insects that the fish feed on. The wetlands created by beaver dams support aspen, willow and cottonwoods—the very trees people mistakenly think they destroy. The daughter of Mary Long, Melony, had come to love the family of beavers in Kings Beach. I’m saddened when I think of the message society sends to young people like Melony when we kill something that is inconvenient or perceived as a nuisance. Then I think with gratitude of people like Ted and Sherry Guzzi, Sheri Hartstein and Mary and Melony Long, who are working hard to educate all of us, even Big Brother, that there is another way. Check out Sierra Wildlife Coalition’s Facebook page to learn more about area beavers and the efforts to help them. Toree Warfield is an avid nature lover, and writes this column to teach and stimulate interest in the marvels that surround us. See the new website: saveourplanetearth.com to read columns and to find links to bird song recordings, additional photos and other content.